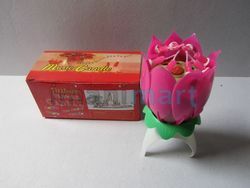 Musical Lotus Candle is packed in a carton of 100 pieces. A ‘agarbatti stick’ is provided with the Lotus Candle. When the white dot at the center of the Lotus Candle is lit using the ‘agarbatti stick, the smaller candles at the side lit up automatically. Then the Lotus opens up and plays the “Happy Birthday melody. We are offering Musical Birthday Candle to our client. Due to our proficiency of this field, we are engaged in presenting Birthday Candles. We are presenting these products to customers within given time-frame. Used in Birthday Party. Play Happy birthday song and Rotation.